If you want to vary the question types you are using in your tests, it's possible to add fill in the blanks questions, that allow your users to write down an answer (or answers) that are automatically graded by the system. What are fill in the blanks questions? Fill in the blanks questions allow the test takers to type in words or sentences to answer a question. 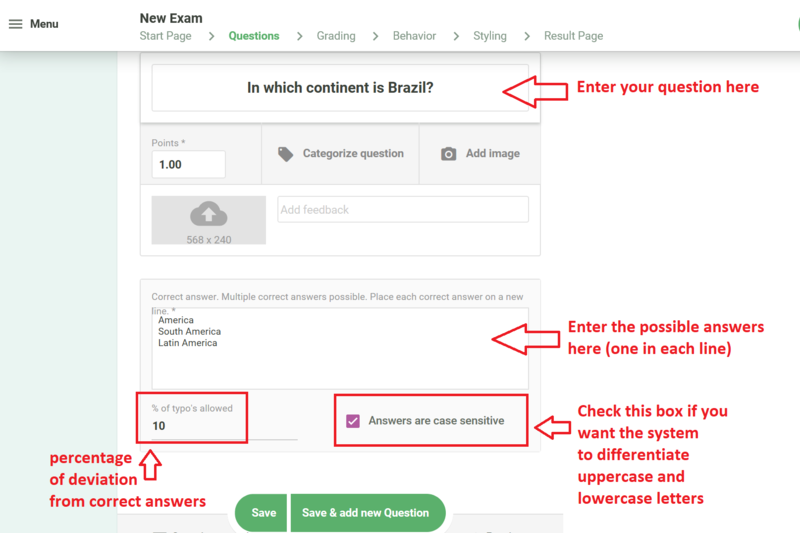 Unlike free text questions, with the fill in the blanks question type, it’s possible for the system to identify the correct answer, making the whole process of grading the exam automated. How to write good fill in the blanks questions? Basically, make sure to write a simple answer, so the students have a greater chance of getting it right. And you can determine a percentage of 'deviation' for the answer you wrote, like typos, spelling or writing mistakes and things like that. What is the name of the queen of Great Britain? In which continent is Brazil? And that’s not all. We have a lot of other question types to offer. Start creating your first exam and see for yourself!